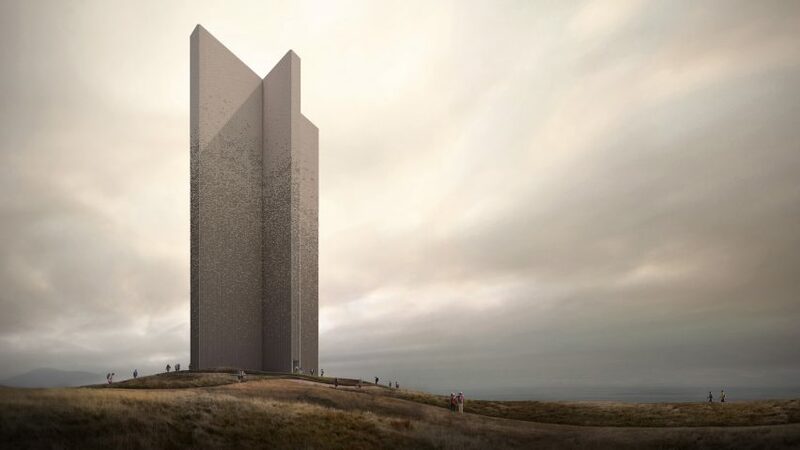 Designer Giles Miller has worked with visualiser Forbes Massie to draw up designs for a huge monument with a cross-shaped plan and textured brick walls. Miller and Massie's 14-storey Monument is designed to be completely hollow, allowing visitors to inhabit it. Working alongside structural engineers from Arup, Miller's studio took on the conceptual project to "push our creative discipline as composers of materials to a new scale". From above, the structure appears as a cross – with the points directing towards the north, south, east and west of the surrounding landscape. The building's crossed walls would work together to spread and carry wind load to the foundation, allowing it to remain hollow on the inside. "Monument manifests purism in its design and realisation," said Miller. "Simple and enormous intersecting walls give a balanced symmetry but are also the means by which the structure stands at the height of a 14-storey building, with an entirely hollow core." "Each wall carries its own weight vertically downwards, but the wall segments also span horizontally onto their neighbouring perpendicular wall, thus wind load descends to the foundation in shear," he added. Entrances on the eastern and western points would welcome visitors into the space. A single shaft of daylight shown permeating through the centre of the building is intended as the only natural light source within the monument. Staying true to his background in surface design, Miller envisioned that the monument would feature a facade composed of wedged bricks, angled to catch the light at different times of day. "The components of the piece, its bricks, are formed by extrusion with wedged faces, and are specifically composed to vary tone and create a kind of light-powered pixelation on the surface," he said. "This innovation is the antithesis of technology, a beautifully simple celebration of light." While Monument is just a concept, Miller has previously designed and realised a number of outdoor, site-specific projects. Previously, he created a spherical sculpture formed from hundreds of reflective "pennies" for Devon's Broomhill Sculpture Park, and more recently a shingle-covered pavilion for the English countryside. The project marks the first time Miller has worked alongside Massie, who previously exhibited a series of architectural renderings with a painterly rather than photorealistic aesthetic at an east London gallery.